Below is a listing of the participating vendors for the 2018 Handmade Holiday. This list was created so you could get do a little preview shopping before the event, and continue shopping after Handmade Holiday has happened. Feel free to follow the links to get in touch with these wonderful artists to complete your local handmade holiday dreams! Favor your skin naturally with handcrafted soap made from ingredients traditionally used for skin care by indigenous cultures worldwide. We utilize food grade seed and nut oils, floral and herbal essential oils, natural plant materials, and high purity water extracts thereof. Each bar incorporates at least one ingredient tenderly grown in the “South Wedge” of Rochester, New York, a prized horticultural area for the last hundred years. Remaining flora are purchased from cultivated sustainably farmed sources, not robbed from the wild. The base oils are made into soap by the energy efficient cold process which retains the natural glycerin yielding a softer texture soap than commercial hot process bars. South Wedge Botanical Soap contains no animal products, synthetic fragrance or detergents. Our recycled paper and cellulose film packaging is completely compostable. Quiet moments of reflection have the power to lift your mood and improve your life. That’s why I created Light Within Candle Co. Inspired by the healing benefits experienced through Trataka (flame gazing) and other meditation practices, each hand-poured candle serves as a support tool and physical reminder of relaxation and self-care rituals. 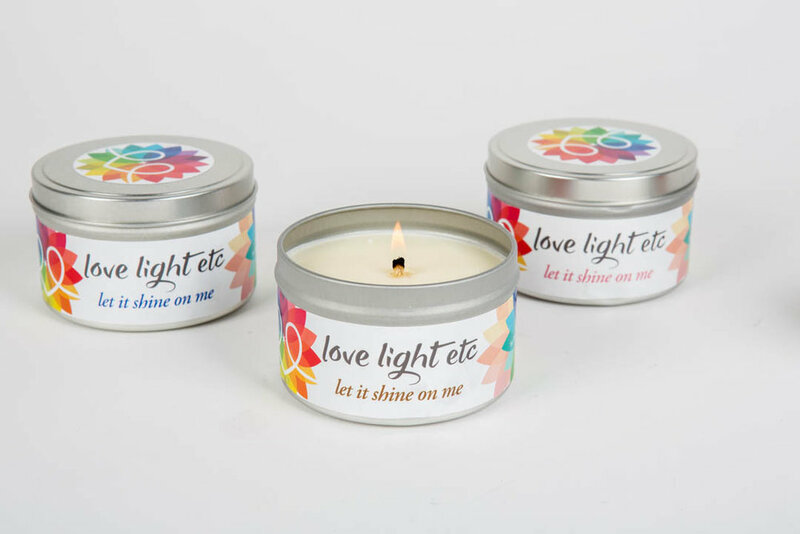 Made in Rochester, NY with 100% soy wax, natural fragrances and essential oils, Light Within candles are a phthalate and paraben free, eco-friendly addition to any home or travel bag. Faith Gruver is a professional illustrator living and working in her hometown of Rochester, under her business, Faith Gruver Studio. During the holiday season Faith creates one of a kind, hand-painted ornaments that are sure to make a cherished gift for years to come. After earning her BFA from RIT, she now works as a freelance illustrator with a specialty in portraiture and branding, working in a variety of mediums including acrylic, gouache, and digital painting. Her style is inspired by classical realism, with a touch of whimsy in her impressionistic backgrounds. Faith's upcoming solo exhibition at 540WMain Community Learning Academy will focus on a common theme in her work, celebrating diversity and creating a space for underrepresented individuals. Bonnie Yannie handcrafts small to medium original stained glass pieces for window hangings. Also, some small colorful ornaments will be available for a reasonable price. Anna Overmoyer is a traditional and dimensional illustrator. She grew up in the forest and has always imagined the creatures that lurk just beyond our sight, pulling nature’s strings. On the the traditional side she paints with watercolor and ink; fairies and mythical creatures. On the dimensional side she creates puppets and sculptures of the same; often integrating wire, paper, polymer clay, acrylic paint, fiber and found objects. The fay were created to fill the gaps in our understanding of the world. They take over where science and fact leave off, allowing for unhindered imagination. That grey area is the infinite resource that fuels her art. Anna of Sketch Studio is a local keeper and documenter of fairies, panic turtles and other magical beasties. Anna uses safe, ethical hunting methods [mostly] to capture rare and useful fairies. Forgetful? Brown thumb? Bad case of the Pox? There is a fairy for whatever ails you. Working with over ten years experience and a passion to create, Mark Thone builds unique jewelry handmade from precious metals and gemstones. Combining classical techniques and contemporary jewelry ideas into one of a kind and custom pieces. Just Terrific specializes in miniature books full of fine detail. Necklaces, earrings, and pins, all function as little journals while also showing off your love of books. Artist Rachael Gootnick strives to reuse items that otherwise would end up in a landfill, by upcycling materials like leather and paper to create her unique pieces. In addition to her miniature book jewelry, she also creates decorative and functional book art as well as larger journals for sketching or writing. If you like books, you will surely be smitten with her handcrafted goods. Find her on the 2nd floor of St. Boniface or on her website. Rebecca Lomuto has transformed her designs into wearables and home goods perfect for the holiday season. You will find her usual hand-bound books, prints and photographs along with a new lot of fiber goods that have been hand-printed with natural dyes and an extra bit of love. JackBear Stamps hand carves rubber stamps. John "Jack" Ballou has been straining his eyesight to hand carve rubber stamps for 15 years. He is inspired by pop culture, comic books, wrestling, nature, and iconography from Western New York. Jack also uses his stamps to create prints on magnets, buttons, and journals. His newest inspiration is creating printed kits that can be assembled to make articulated paper characters inspired by other local Rochester artists. Jack is always up for a challenge, and does commissions upon request. Transit Apparel is a celebration of Rochester history, culture, and pride. Since 2013, Transit has featured series themes that highlight city neighborhoods, city nicknames, seasons, and even urban legends. There is so much to Rochester that people just pass off as Upstate (which isn't even accurate), and Transit is here to share the stories of our fine city, one t-shirt at a time. Emily Bellinger of Mmmily Handmade is a local Rochester, NY fiber artist & maker. Mmmily Handmade is a collection of hand crafted bags, accessories, and home goods using a variety unique, modern, and hand-printed fabrics. At her booth you can find handmade zipper pouches, clutches, backpacks, ovenmitt & potholder sets, R-rated catnip toys, and more! Bee Paper House is the small design studio of lettering artist Brittany Statt. BPH offers hand-lettered paper goods and home decor including art prints, tea towels, coffee mugs, and signs. All wood signs and chalkboards are built from scratch, each one made completely unique. Canopy Design Co. is a design studio based in Rochester, NY with a passion for video games, grids, and a systematic approach to illustration. Les Lettres by Alexia Chambers is a fluid, fiber art and hand lettering business. Her main focus is creating abstract art with fluid acrylic paints and alcohol inks. She also creates hand woven pieces and items adorned with hand lettered quotes. Her art is perfect for anyone trying to add some life into their spaces as she has pieces for everyone, from muted and simple, to vibrant and eye catching. The sisters, Karen and Leanne, repurpose wool sweaters into fleece lined wool mittens and headbands to keep you cozy warm for those cold winter months ahead. Crown Custom Craftworks is a woodworking and furniture making project based in Rochester, NY. Nick Brown, the sole craftsperson behind Crown Custom Craftworks, combines modern & rustic aesthetics to design furniture and hand carved housewares, focusing on using salvaged and foraged woods in creating each unique, individual piece. Collaborate & Create is an artist educator collaboration. Alyssa is a local artist teacher who will be bringing macrame goods, ceramic planters, and origami earrings. Working alongside her is Amanda who is also a local artist teacher. She will be bringing fused glass goods, ornaments, and woven bracelets. Both are excited to be at Handmade Holiday for the first time and can't wait to see you there! Johanna Patashnick’s work is inspired by nature. With crepe paper, she creates flowers, foliage, and seasonal decorations. Each petal and leaf is handcrafted which makes each piece unique and lifelike. She hopes her creations will bring joy to you and your loved ones for years to come! Heather Berhendt creates handmade lampwork glass beads and cabochons one by one in a 2000 degree torch. Designs are "drawn" in the flame freehand with hairthin pieces of glass less than a millimeter thick. Layers of glass are fused together in the flame to produce unique luster and shine. After a slow cooling process, she uses copper electroforming to slowly "grow" metals onto the glass to form earrings, pendants and rings. This gives them a unique organic rustic quality and each piece is truly one of a kind. La Belle Maison's unique use of color is so refreshing! Once you've held one of her creations in your hands, you’ll know that she has very thoughtfully chosen each fabric to create a unique piece of heirloom quality craftsmanship. Not only are her pieces practical and durable, they compliment today’s bold use of color. Being able to purchase a piece of textile art made from 100% reclaimed fabric is also satisfying, you would never know that these materials were destined for a landfill. 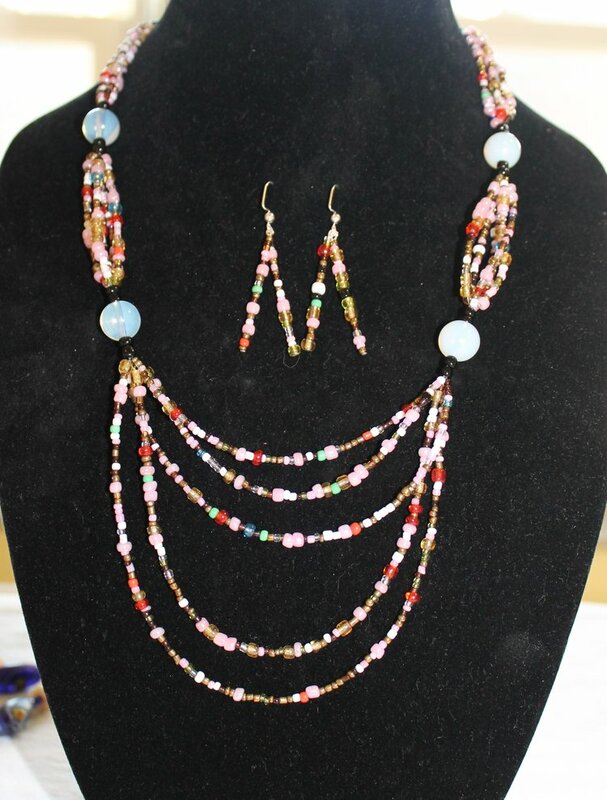 When you make a purchase from the Donna Kurten Collection you aren’t just getting a piece of jewelry. You are buying a handcrafted item that Donna has meticulously created, focusing on color, style and texture. She also has unique gifts. Her whimsical earring trees take you right into a Dr. Seuss story, each having character and a personality of their own that can be seen through the beads and trinkets that she has carefully chosen. And newly added to the collection are her Garden Flowers made from beautifully repurposed china and glassware that were once used to feed our community. Add a little color to your winter wardrobe with a one-of-a-kind handmade scarf and hat! sjcolor knits are mixed-media fiber knits that are a perfect addition to any outfit. You are going to need one... or two! The Nerdy Octopus offers a variety of unique handmade gifts and home decor. We have a passion for all things geeky, snarky and fun. We focus on cross stitch and paper craft art that mixes beauty, humor, and a lot of sarcasm. With much love for traditional Japanese paper called washi, qq creations started creating washi art and jewelry in 2010. Her thoughtfully handcrafted works are inspired by Japanese and US culture. qq creations' peaceful cranes made with Japanese color pallets, patterns, and designs are sure to bring a smile to your face. Tom Zachman started making glass things in 1978. He currently works with traditional stained glass, fused glass, recycled wine bottles, and upcycled bicycle parts. Yes, He’s the guy pawing through your road-side trash after dark, salvaging bicycles and wine bottles… Particularly, Ice Wine bottles are a favorite of his. Spotted Rabbit Studio’s Apprenticeship Program is a community-focused, art-based, program for adults with developmental disabilities who collaboratively make, exhibit, and sell their work in the local community. 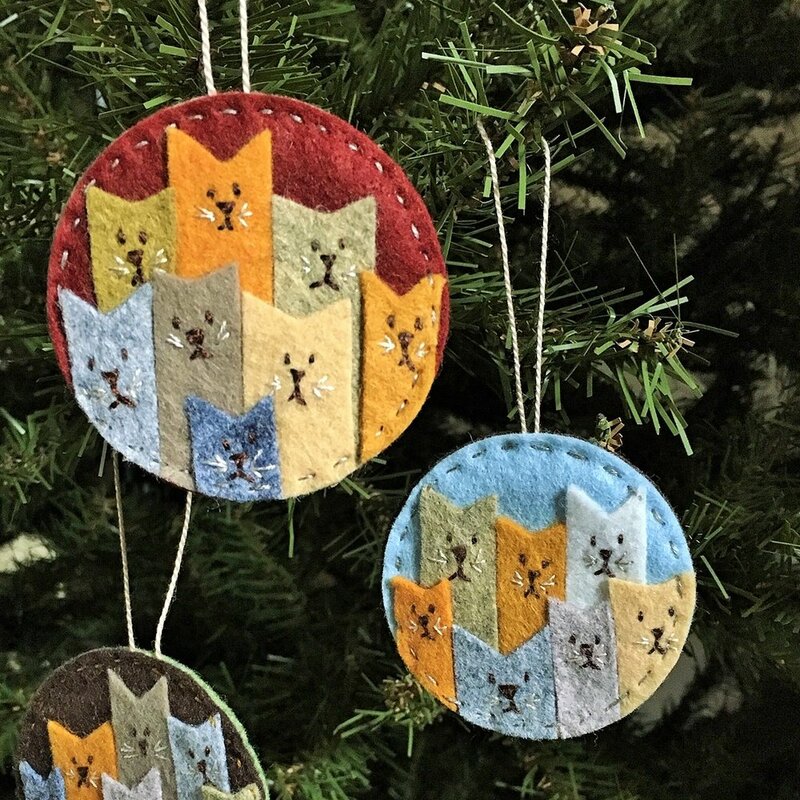 For Handmade Holiday they will be fully stocked with ceramic ornaments, animal bells, original mono-prints, tons of stocking suffers, and their signature alcohol ink coasters. Artists Becky, Ellie, Teeva, Adrienne, and Stephanie can’t wait to see you on Dec. 1st! Owl Post Lettering is a one-woman company driven by a love of our city of Rochester, intersectional feminism, self-care, and a love of mugs. Anna, chief magic-maker at Owl Post, believes in big feelings, smashing the patriarchy, and that having too many mugs is a myth. She’d love to help you make someone smile this holiday season. Rachel has been hand-crafting jewelry in Rochester for the past year. With a focus on clean minimalist lines, each piece is delicate and classic.... perfect for an everyday look or special occasion! You can find Rachel selling her handcrafted jewelry in the German House again this year! Copper Bunny Creations is a small sole jewelry artist based in Rochester, NY. Each piece is uniquely handcrafted utilizing copper wire & elements into pendants, bracelets, and earrings. Utilizing a variety of stones, gemstones, and metals to crate various types of jewelry no two pieces are alike. Each item has its own identity and has been handmade for you! Bull Elephant is a maker of fine beard grooming products started in 2016 by Tom Gottschalk and Jake Miano. They create handmade high quality beard grooming products from Rochester, NY. Bull Elephant is a company whose paramount purpose is to create and procure goods that are befitting for people who prefer quality over quantity in an equitable capacity. This is something they provide through products that are straightforward and purposeful. Their emphasis is on being proponents of local trade as well as fair and equal practices. Allison Mccue creates complex designs with paints and pens that satisfy her inclination toward symmetry and color balance. According to Wiki—"A pattern is defined as a regularity in the world, man-made design, or abstract idea," and that's exactly what her art is all about. She finds the regularity of patterns both comforting and visually stimulating, add to that intricate linework with .005 pens or smaller, and she enjoys losing herself in the challenge of it. The fluid art paintings she’s been working on lately fulfill her affection for abstract designs with unexpected pops of color (not to mention her love for vintage Science Fiction and Fantasy book covers). In developing new ideas and directions for her art, she often looks to her family, nature, or other artists- all of whom have concepts and creative ideas different from her own but each of whom offer daily opportunities for learning and inspiration. She is most interested in creating pieces focusing on color, detail, and overall balance. With Patterns and Lines, she makes one-of-a-kind designs with geometric shapes and intricate detail into paintings, jewelry, cards, and prints. I am a cat. I am a black cat. I am a black cat who likes all things horror. I am a black cat who enjoys drawing horrifically humorous horror memes. I am Black Cat Horror Memes (cue evil laughter)!!! While healing from an iatrogenic injury, RASJACOBSON began drawing and painting as a way to distract herself from her pain. Recognizing there was an enormous disconnection between how she looked on the outside and how she felt on the inside, she began to share her story via social media where she connected with other people who indicated they, too, were struggling to overcome invisible obstacles of their own. Inspired, she felt compelled to paint impressionistic portraits based on the stories people shared. Inspired by the resilience of human spirit, RASJACOBSON hopes to help people realize that pain presents us with an opportunity to connect with and support one another. @Stormymade is a Rochester based web artist, who makes digitally collaged candy colored Pop-Art. @Stormymade makes art for everybody - cat enthusiasts, memers, Trekkies, Rochester nerds, and even Guy Fieri Fans. Come see her fabulous assortment of stickers, posters, magnets, pin-back buttons and more! These goodies are perfect for the extremely online people in your life. Fuego Coffee Roasters is focused on roasting and brewing fresh artisinal coffees from regions all over the world! Fuego has been educating the Rochester community on the uniqueness of single origin coffees for the past 5 years. From sourcing ethically, to roasting strategically, and brewing with state of the art methods Fuego easily serves some of the best coffee in the northeast. Renee Colon, Co-Owner and operator of Fuego Coffee Roasters will be serving at the event! Fine hand carved wooden spoons and treen. Gathered from local woods and carved to carefully form a marriage between a sculptural item and you favorite every day kitchen tool. Made to honor traditional tools, the trees they come from and the pots they stir. Sashfield”s Studio is a culmination of over twenty years of artistic exploration and adventure in the pursuit of expression through imaginative and beautiful hand crafted times. The hand painted wine glasses, bottle and magnet are created for fun times and fond memories. Each hand forged iron wine rack brings functionality and beauty to any wine lovers home. Mad Coast - your home for rad infant and toddler clothing along with Rochester themed adult apparel! Stay cozy this winter in your ROC CITY LOCAL hoodies & tees! A local of Rochester, NY, Victoria Savka is a flourishing illustrator and artist. Her current work strives to capture the emotion, character, and beauty of the world around her. She has excitedly been creating a herd of animal drypoint prints. Much of her work currently consists of her whimsical doodles and abstract portraiture! She is an active member of the Print Club of Rochester and currently teaches art at St. Agnes School in Avon. Victoria lives in Scottsville, NY, with her family and their chickens. Cat Clay specializes in sweetly-snarky pottery, designed to appeal to your inner fan grrrl. Whether you're looking for mug shots, squirrels with guns, or twinkling Death Stars, Cat Clay will deliver. No surprise - it's owned by a gorgeous calico cat. Meow, dudes. Boho-style jewelry for the fun and funky in your life! Organic Loose Leaf teas and herbal tissues are blended by Tea Tzar Cynthia Evans, owner of Tea-Licious Trendz. A one person woodshop in Rochester’s South Wedge area making wooden boxes, tables, cutting boards and more. Genesee Libby Studio uses the 19th century wet-plate collodion process to make unique photographic images on glass and metal. In addition to our portrait photography, we make tintypes, ambrotypes, custom tintype jewelry, and prints inspired by the natural world. Looking for gorgeous, all natural, non-toxic, lead-free beeswax candles this holiday season!? Honey Brook Art and Wellness has you covered! All beeswax is sourced from Western New York farmers and this practice upholds their mission to support other local business's who are good to the earth. With Honey Brook, you know you are making the best choice for your home, your environment, and your local economy. No soy, no petroleum, just simply natures most perfect wax from the hardworking bees of our region! Honey Brook provides candles unmatched in quality, beauty, and functionality. Along with a bounty of beeswax candles in a variety of scents like Simply Honey, Balsam & Beeswax, Cinnamon & Ginger, Peppermint & Lemon, Hemlock & Vetiver, and Orange & Vanilla, Honey Brook also carries a line of natural fire starters, beautiful handmade journals, handmade cards, and leather journal covers. Find them this year at Handmade Holiday! Making the Nest of It features fun and functional home décor items. Pairing super cute with highly useful is their goal. ROC Map themed items (magnets, ornaments, clips) are always a big hit - and they will have a large stock of South Wedge map items just for Handmade Holiday. This year, they’re featuring some brand new sized clips and magnets, newly designed felt ornaments, and event mountain boxed sets. Most everything is one of a kind and uniquely giftable. Metz Miller Designs is a husband and wife team that specializes in wire wrapped Herkimer diamond jewelry. The diamonds are mined by Chris, and Steph creates the jewelry out of the stones. They also create beer label coasters and wooden growler carriers. 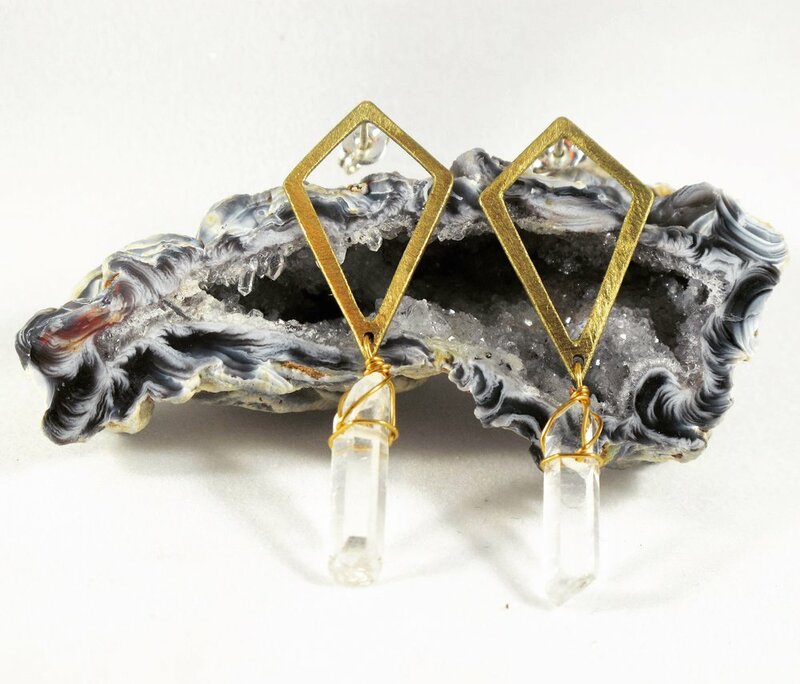 Rancho Eyes is jewelry inspired by geometry, patterns, and symbols, both common and arcane. From the complex three-dimensional forms of crystals, to prehistoric art, to the purity and universality of the circle – the recurring shapes of our world serve as the basis for jewelry that combines minimalist simplicity with bohemian eccentricity. Pieces are created in Rochester NY using traditional metalworking techniques, such as sawing and soldering, as well as beading and wire wrapping. 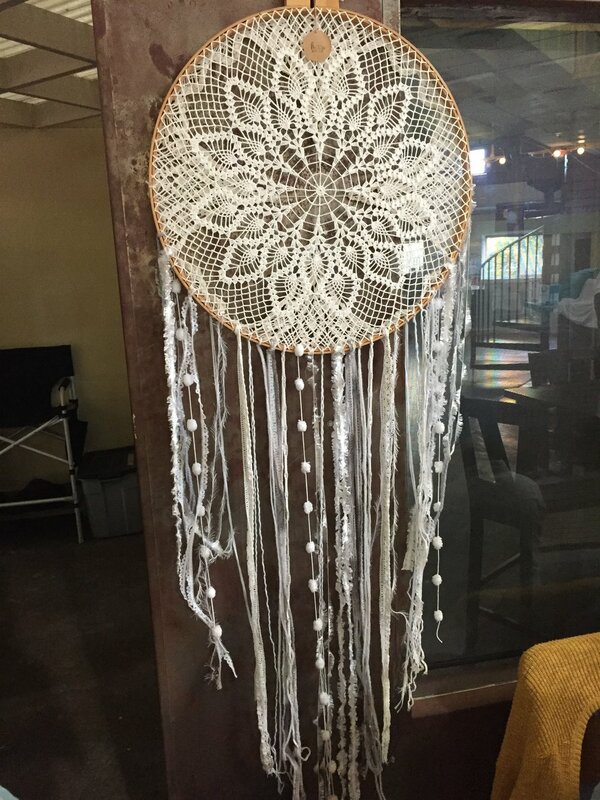 Erica Robinson of Hoop Dreams Art is constantly experimenting with new techniques and designs for her hoop art. You will find one of a kind pieces and hand-stitched gift items using many vintage and repurposed materials. Find Hoop Dreams Art on Facebook or Instagram and give her a follow. A bunch of glass mushrooms on a birch log, a volumetric cylinder made to form wine goblets, a hand-blown glass beehive pendant light with swarming bees... Inspired by nature, family and her scientific glass background, her work is unique and one-of-a-kind. Working in an open flame, Sage creates works of functional art. Bubbaloo’s focus is on creating unique, colorful clothing and stuffed animals. They love to incorporate up-cycled items and vintage fabrics into bright, fun items for babies and children. Knit Buffalo is WNY’s first yarn truck. It offers heirloom quality yarn from indie dyers, knitting needles, notions, and hand knit hats. Spreading love and light is the mission of Love Light Etc. Made with soy wax, cotton wicks, and non-toxic, phthalate-free fragrance oils, each candle is hand poured in the South Wedge. These candle tins make great gifts for your families and friends! Goat Isle Soap is a company based on providing an all natural product that not only heals and repairs, but helps maintain beautiful radiant skin. All products are made on their farm in Brockport NY and contain raw goats milk. Raw goats milk is packed with vitamins, minerals, and fat which helps sensitive skin, acne, eczema, and premature aging. Goat Isle Soap takes pride in using authentic ingredients and eco-friendly packaging. They offer soap bars, facial bars, shampoo bars, bath bombs, body balms, and accessories to preserve your skin. They believe in a healthy skin care routine and love being a part of this amazing community! Hi! My name is Danielle DeCaro. I share this crazy beautiful life with my husband and our crazy little rescue pup Genesee. By day I’m an elementary art teacher, sharing my love of all things creative with my students. They tell me all the time how lucky I am to get to make art everyday and I completely agree. Working with them inspired me to start making art of my own again—playing with all the materials I loved as a child-beads, glitter and paint. Getting to see art through the eyes of my students reminded me how magical and special a little Sparkle can be. What began just a few years ago as a few homemade holiday gifts, quickly grew into a part time small business. I specialize in transforming glitter from "eek" to chic and reinventing basic (often less-than-desirable) craft supplies with a sophisticated twist. Stop by Handmade Holiday (downstairs in St. Boniface School) to put a little Sparkle in your shopping bag this holiday season. Stock up for everyone on your shopping list with sparkly silhouettes, beaded bangles, and cute-as-a-button earrings (no really, they're literally buttons!). Looking for something bolder? Try on one of the handmade statement necklaces, leather earrings or industrial washer studs. Because….Who doesn't love a little Sparkle? Wilhelmina is named after my Great Grandmother. Her life intrigues me. She had 13 children, lived in a cabin in Minnesota and played the piano for silent movies. My earliest memory of knitting is on the couch snuggled next to my Mother at an early age. She patiently taught me how to knit, crochet and sew. I am a Pediatric Nurse. I love children, whimsical things, animals and nature. My animals and dolls are handmade from wool that I spin. My wool comes from friends that are local shepherds. I hope that my creations will bring out the child in you! Come see how Teson HOME re-purposes locally sourced pallet wood in ways you've never imagined. Explore their festive and unique holiday home decor pieces, from beautiful star tree toppers to snowflake ornaments and lightweight wood and twine garlands to fancy up your home. Browse through their ever-growing PalletWood Pendants & Earrings collection and pick out a special gift for someone you love. And start your own collection of their hand painted blocks to celebrate just about ANYTHING! Visit Teson HOME at Handmade Holiday this year and find something truly one of a kind. Come visit our tables laden with handcrafted polymer clay jewelry, ornaments and framed pebble art and so much more. There is something for everyone on your Christmas list. We look forward to seeing you! Charlie Blu is a one of a kind, handcrafted, polymer clay jewelry business here in Rochester, NY. Blu specializes in lightweight and durable necklaces as well as stud, dangle, and bold statement earrings. Mixing neutral tones with pops of color and texture, Charlie Blu was made for all shapes, sizes, styles, and occasions! With necklaces made on waxed cotton cords, and hypoallergenic backed earrings, Charlie Blu is ready for you to get your style on! Zimmer’s Bakes is in it’s 7th year in business. Baking cookies, baklava, brownies and a few healthier gluten friendly & vegan choices. The Lettering Loft is a small business that offers unique custom lettered art. Wooden signs, prints, canvas, home decor, seasonal decor and gifts. Signs for weddings and other events, custom envelopes for invitations, framed art, and plenty more. We love adding a special, personal touch to important moments in people’s lives. Offering most custom orders, we love a challenge and we love trying new things. Sweet & Cute Sweets is a small specialty food biz based in Honeoye Falls, NY. Our main product, Coffee Syrup is a thick syrup hand-crafted in small batches with just real coffee and organic sugar. Sweet & Cute Coffee Syrup is delicious on and in everything from milk and ice cream to cocktails and BBQ sauce. We also make sweets with our Coffee Syrup, like Salted Coffee Caramels and Cafe Mocha Fudge. Peppermint is a local women’s apparel brand + boutique. In addition to clothing the store also supports the work of over 120 different artisans ranging from jewelry to apothecary & stationary (like one pictured above by Skyvannah). Rachel Anna DeVona has been a Rochester resident for 4 years and making art her whole life. Rachel is primarily a portrait and figurative artist, working with oil paints, pencil and ink, and occasionally gouache. She is a studio renter at The Yards where she hosts a monthly figure drawing night. For the Handmade Holiday show she will have a selection of hand painted maple wood tree ornaments, as well as packs of seasonal notecards. Now is the best time of year to send and receive mail! Send a little love. At branchhomestead we make reusable home & wearable products from washable paper fabric. Our goal is to encourage less waste by making reusable products from a biodegradable fabric. Currently we make a produce bag, clutch bag, grocery bag, wine bag, baguette bag, pint containers, outdoor garland and coasters. The fabric used to make our products can be washed in the washing machine with like colors and air dried. The more that you use and wash our product the softer it becomes and the more it looks and feels like leather. I've delved into more jewelry making as well (thus the "and" in "itty bitty and..."). Necklaces are created with three tiers and an extra long, adjustable chain or cording. Bracelets are adjustable too to fit your wrist. Both contain dangling gems for a special touch. Create a beautiful set with earrings that match! Stefani is a self-taught paper artist specializing in original designs stitched on paper and wood with colorful specialty threads and embellished with tiny seed beads and crystals. Her work combines technology with the artisan tradition. Stefani has her designs laser cut with miniscule precision. She then stitches each piece by hand with needle and thread, one stitch at a time. She sells her handcrafted goods through art fairs and local stores. When not making her own art, Stefani is busy with related activities. She is the founder of Rochester Artisans, a networking group with over 2500 members.